Promise has introduced three new storage systems using the Thunderbolt 3 interface and aiming users of the recently introduced Apple MacBook Pro notebooks. The new Pegasus3 Symply Editions can accommodate up to eight hard drives with up to 48 TB capacity and deliver up to 1.6 GB/s read performance (with HDDs), which will be beneficial for those working with large amounts of data, such as video professionals dealing with UHD content. The Promise Pegasus3 Symply Edition external storage family consists of three models: the R4, the R6 and the R8 with four, six and eight 3.5” hot-swappable bays, respectively. 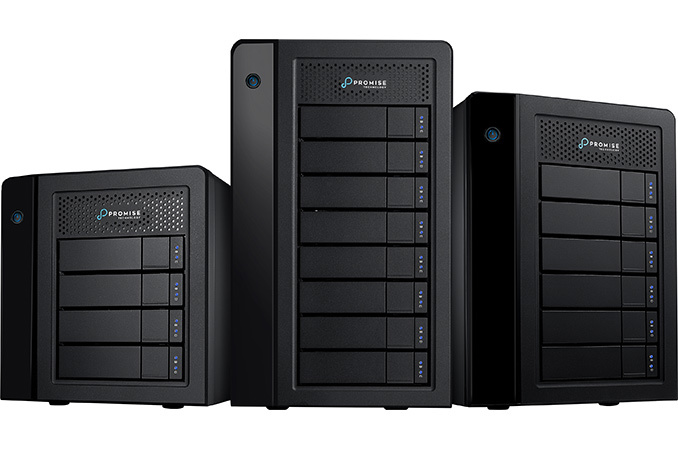 The entry-level Pegasus R4 is offered with 12 TB of capacity and supports hardware RAID in 0, 1, 5, 6 and 10 modes. The more advanced Pegasus R6 and R8 feature capacities from 18 TB to 48 TB as well as support hardware RAID in 0, 1, 5, 6, 10, 50 and 60 (R8 only) modes. All of the Promise Pegasus3 Symply Edition storage solutions come with Symply’s Always-Up-to-Date management software for Apple’s macOS and Microsoft Windows. Remote monitoring applications for iOS and watchOS are also incoming. All the Pegasus3 DAS systems come fully populated with Toshiba’s MD04ACA-series HDDs with a 7200 RPM spindle speed and 128 MB cache. The hard drives belong to consumer HDD lines and officially are designed for desktop computers. Nonetheless, Promise Pegasus3 storage devices are offered with three years of warranty support and 24/7 user support worldwide. Thus from reliability standpoint the new Pegasus3 systems should be in line with competing products from other makers. As for performance, the Promise Pegasus3 are designed to support simultaneous streaming, editing, and backup of 4K video; the peak read/write speeds offered by the Pegasus3 R8 is around 1.6 GB/s when equipped with the aforementioned Toshiba hard drives in a RAID0 configuration. Meanwhile, when equipped with Samsung’s 840 EVO SSDs, the Pegasus R8 system is rated up to 2.7 GB/s throughput. Based on performance numbers supplied by Promise, the Pegasus3 offers 19-57% higher sequential read speed as well as 32-89% higher sequential write speed compared to its predecessor, the Pegasus2, depending on workloads. Just like similar competitive DAS solutions, the Pegasus3 systems have two Thunderbolt 3 ports, making it possible to daisy-chain a display or another TB3 device to the storage arrays. The manufacturer bundles one Thunderbolt 3 cable certified for 40 Gb/s transfer rates with its new DAS. The Promise Pegasus3 Symply Edition lineup will be available online from Apple and select retailers/resellers (including Apple and B&H). The Pegasus3 R4 with 12TB starts at $1499, the Pegasus3 R6 with 18TB starts at $2799 and the Pegasus3 R8 with 32TB starts at $3999. I wonder how these will compare to a more reasonably priced product like the HighPoint 6618A which you can put your own drives in.